While PM 2.5 and PM 10 stayed above the national standards, values of SO2 (Sulphur dioxide) recorded in Delhi were within the National Ambient Air Quality Standard. Delhi witnessed a severe episode of smog in the first week of November, which was described the Centre for Science and Environment (CSE) as the worst in 17 years. 2016 was particularly bad for the national capital in terms of air quality with the volume of ultrafine particulates PM 2.5 and PM 10 violating the annual safe standards by over five times in certain areas. As per pollution data, shared by Union Environment Minister Anil Dave in reply to a question in Lok Sabha, concentration of PM 2.5 and PM 10 steadily rose in Delhi since 2014, where 2016 stands out for a rapid build up compared to the previous years. 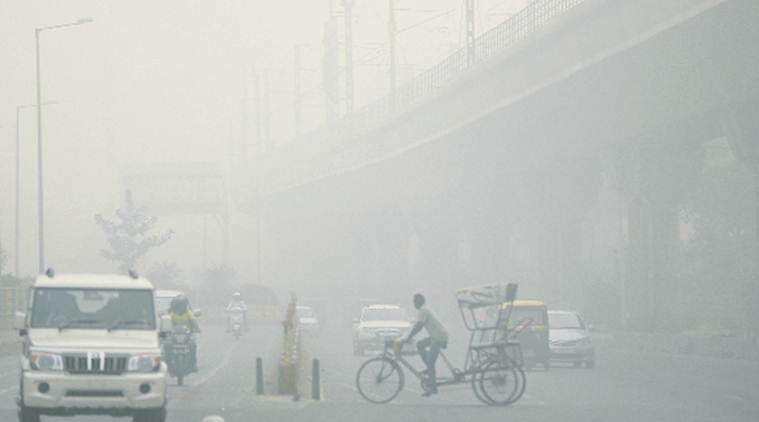 The annual prescribed standards of PM 2.5 and PM 10 are 40 and 60 micrograms per cubic metre (ug/m3) in India. The corresponding 24-hour standards are 60 and 100 respectively. As against the annual standards, the city’s Shahzadabagh monitoring station of Central Pollution Control Board (CPCB) recorded PM 2.5 and PM 10 at 120 and 348 last year while the Siri Fort station recorded it at 102 and 320 respectively. Annual values of PM 2.5 and PM 10 in Shahzadabagh were 62 and 243 in 2012; 88 and 265 in 2013; 69 and 234 in 2014; 99 and 261 in 2015 and 120 and 348 in 2016. The corresponding figures for Siri Fort are: 51 and 291 in 2012; 78 and 181 in 2013; 84 and 209 in 2014; 94 and 189 in 2015 and 102 and 320 in 2016. As a whole, Delhi recorded an average PM 10 volume of 260 last year, over four times above the safe level, while the same was 65 in case of gaseous pollutant NO2 (Nitrogen dioxide). Its annual standard is 40. “The particulate matter concentration was high during November 2016 – January 2017 because of prevailing meteorological conditions like calm weather, low temperature, very low wind speed and reduced mixing height, thereby preventing dispersion of pollutants and leading to their accumulation,” the minister added in his reply. Delhi witnessed a severe episode of smog in the first week of November, which was described the Centre for Science and Environment (CSE) as the worst in 17 years. Since then, the local and the Central authorities announced a number of steps including the closure of the Badarpur thermal power plant and a temporary ban on construction and demolition activities. The Centre has also notified the Graded Response Action Plan and empowered the Supreme Court-appointed panel Environment Pollution (Prevention and Control) Authority to implement it. The EPCA rolled out a series of measures enumerated under the plan, including curbs on diesel generator sets, burning of waste in the open and landfill sites, in mid January.